Ever wanted a binary alarm clock? Me too. So I looked around on Instructables, because there are many good ones around. What's even better: they're based on the Arduino, one of my favourite toys. My favourite is this one: https://www.instructables.com/id/Arduino-Binary-Alarm-Clock/. It inspired me a lot and yes I took the code as a base for my project. But this one is far too big for me. I wanted something I can take with me when I visit Hacking Conventions and don't want to miss the early lectures. Nothing is more annoying, if you finally got some tickets for the con, go there and don't wake up after a long (really long.....) hacking and builing night and miss a workshop you'd really want to join. Actually this instructable isn't complete at the moment. First I thought, I'd just share some pictures, but some friends asked for an instructable, so I'll add a detailed how-to the next days. The pictures on this side are from the first version. You will find newer (but not really better pictures, because my camera died and so I shot a lot of pictures with a crappy web cam or used some for the parts I found on Google) pictures in the following steps. 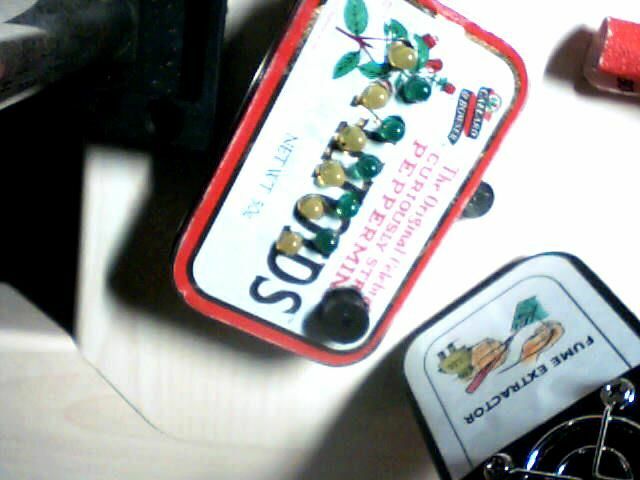 - 1 Piezo Speaker, you could use other speakers too, but it'll be hard to fit it in the tin. If you've got a unused computer case check, if there's something you can use. My one is out of one. Pretty small and all you've got to do is to cut of the connector to the mainboard. - Drill, or something else to make holes in the case for buttons. My first atempt was to just connect the wires to the Arduino. But this wasn't a good idea. they slipped out quite often and it was really a pain to get them back in position. So I decided to make a Proto shield. Of course you can buy one, but hey, we are "makers" not simple consumers. so we can do it quite easy. Take the perf board, mark the size of the Arduino on it and cut this piece out with a saw. Next, insert the the male connectors on the board so that they fit in the Arduino. Don't worry if this doesn't work at your first try. The spacing on the Arduino board differs a bit from that of the perf board. but you can bend the pins if you heaten them up with your solder iron a bit. If everything fits nice, solder it together. Well done! Now bend the long legs to the outer side and solder them to the pads. Ok, let's connect the LEDs to the pins of the protoshield. Same on the lower side. Start again from right and go on to the left side. Grab your ALTOIDS tin, eat the reminding mints (if there are more than you want to eat, put them somewhere else or give them to your friends or family) and clean the box. Wash it, let it dry (water + electronics = not much fun...). Now mark the opening for the USB connector and the power connector on the small side of the tin. Cut it with whatever you feel comfortable with. Don't use too much pressure when you cut or drill holes otherwhise the tin will lose it's shape and looks disgusting (or even worse: doesn't close right anymore). Now it's time to add the buttons for setting hours and minutes, the switch to change time/alarm time setting and the Piezo speaker. Place it wherever you find free space in your tin. Maybe on the lid of the tin, maybe on the side. Look at step 4 to find out the right pins. I'll add this step as soon as I've got a working touch sensor switch. Unzip and place the folders in the folder libraries in your sketchbook folder. Now download the binary clock source code attached to this step, unzip it, and place the folder in your sketchbook folder too. Plug in your arduino, open the binary_clock_v1 sketch and press the upload button. If you did it right, you reached your goal and your binary alarm clock should be ready! If it doesn't work first check all connectons, maybe you made an unwanted solder bridge somewhere? Maybe you connected something to a wrong pin. Hey is it possible to use an arduino uno ? That's awesome. I love the pro mini's. I'm currently building one inside an alarm clock housing, making use of the existing switches, buttons, and alarm speaker. The only thing left is a battery and fix on few code glitches. As for a guide how to make it is pretty much the same you only have to solder carefully and re-arrange some pins assignment. Hi! Great Project. I was wondering how you were planning on making the touch sensor. Hi, thx :) The touch sensor will be integrated in the next version. I think it'll be mounted somewhere on the top of the tin. At the moment I'm working on a nicer sound output. I want to add a Commodore SID chip to play some music files instead of the annoying Piezo beeps. I am having a hard time soldering the headers in with out having a pad to solder to and also did you have to drill out the holes because the holes in my perfboard are not lining up with the holes on my arduino?